Is Grey Hair Dye Going Mainstream? I have been spotting celebrities going grey haired everywhere. Some let their natural grey hair shine through and some use grey hair dye to achieve this look. 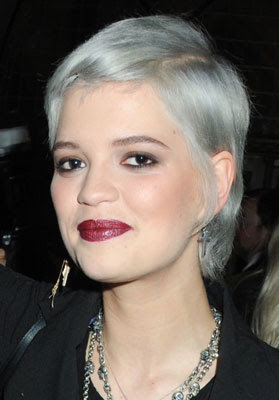 Celebrities from Emmylou Harris to British star Pixie Geldof are all turning to this grey hair dye trend. I’m not sure that there is an actual grey hair dye product on the market, but I think instead, these young celebrities are going grey haired thanks to an ash or blue based hair color. The process could take a while, especially if you are starting with dark hair. The process would involve bleaching or lightening hair to the palest of yellow or blonde and then coloring the hair with not grey hair dye, but an ash based one. If you know that under all that hair color, you have a full head of grey hair and you want to go for that look. You can get there by touching up your re-growth with a semi-permanent hair color instead of the usual permanent. The semi-permanent hair color will allow your grey hairs to grow in gradually and blend your previously colored hair with your newly grown in grey hair. Trend is Hot”So who is grey hair for? I wouldn’t say that many people can pull this look off in their teens and twenties. I’d say to hold off on the grey hair dye look and go grey gracefully as you age if that’s the look you are going for. So why is grey hair dye or letting your natural grey come through so popular these days? Perhaps it’s because it’s something different for young celebrities to try. As for aging celebrities and the rest of us, it is low maintenance to go grey naturally and that may be why they choose it. Next time you place an order at Amazon take a peak at “Going Gray, Looking Great! by Diana Lewis Jewell,” she’s the guru on the topic. January 12, 2013 By: Barb Quinn Hairstyle Blog Leave your comments (1), Your input matters. Get the right hair colors for your skin tone in sync! Your skin tone plays a major role when determining what the right hair color is for you. And, getting the right hair colors for your skin tone right is not as easy as product manufacturers might have you think. One thing you may have learned the hard way from box hair color is, ‘what you see is not what you get.’ A note to the wise . . . always read the chart on the back to determine what hair color you can expect to come out with when put on your strands. Back to your skin tone, the right hair colors for your skin tone can make you glow, or even melt away the years.The wrong hair color for your skin tone will make you look sallow, sickly, worn out or freaky! And if that’s not bad enough, harsh contrasts or flat tonalities will emphasize lines and angles, Yikes! So, what is the right hair colors for your skin tone? Your Skin Tone, Warm or Cool? You may be stumped as to whether you fall into the warm or cool category when determining the right hair colors for your skin tone. Here are some questions to answer that will help. Using the basic color chart above, which colors look best on you? What are the color of your veins on your inner wrist? Your skin tone is, dark brown, brown with pink undertones, olive as most Asians and Latinos, medium with no color in cheeks or pink cheeks, medium with golden undertones, pale with no color in cheeks or pink undertones or brown or bronze when you tan. Your skin tone is — brown with golden undertones, pale with peach or gold undertones, freckled, ruddy or golden brown when you tan. What if you cross over the lines and have both warm and cool traits? The most basic principles of color theory applies when trying to find the right hair color and your skin tone. Take a look in your closet and see if you see a trend happening here. Using the color chart, what colors look best on you warm or cool? If you can’t be objective, ask a few friends whose opinions you value. It’s easier to evaluate what we like on others than on ourselves don’t you think? Here are the basics for what hair colors will go well with your skin tone. But, I need to emphasize that all hair colors have different values, or how deep or light they can be formulated and that will also have a bearing if the hair color will be right for your skin tone. If you want beautiful, multi-dimensional hair color like you see on the celebrities, you should leave it to the pros. Even if you are set on coloring your hair at home, it could benefit you to consult with a hair colorist first or choose a highly reputable salon. You can check this out for sound recommendations. They may or may not try to talk you into their chair, but they also can evaluate your hair and skin tone and give you direct hands-on advice. December 1, 2012 By: Barb Quinn Hairstyle Blog Leave your comments (33), Your input matters.